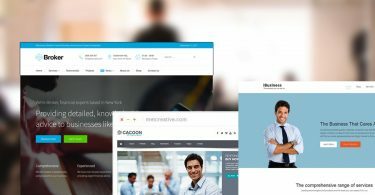 This collection of responsive WordPress themes is helpful for those users who wish to create powerful website to showcase classifieds and job listings. Classified websites are trending these days with many customers and business owners relying on these sites for buying and selling goods respectively. Job board websites are beneficial for both employers and other people who seek employment. Employers can list out the total positions whereas employees can apply for the relevant job vacancy over the web. 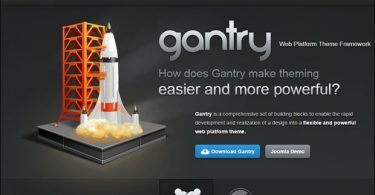 These themes feature visual composer, front end submission, Google maps and payment gateways. 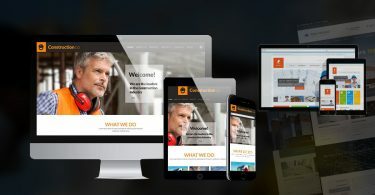 Your website will look amazing on all devices due to its responsive design. Now, take a look at these 15+ Responsive WordPress Themes for Classifieds and Job Boards. Jobinn is the responsive job board wordpress theme that is designed for creating the job sites or other larger sites requiring the job board. It is a content driven job driven directory theme which showcases the job listings. MeshJobs is the flexible and dedicated wordpress theme for job boards which is backed up with WP Job Manager plugin. It is the perfect theme for Job Companies, startups, recruitment agencies and HR companies. 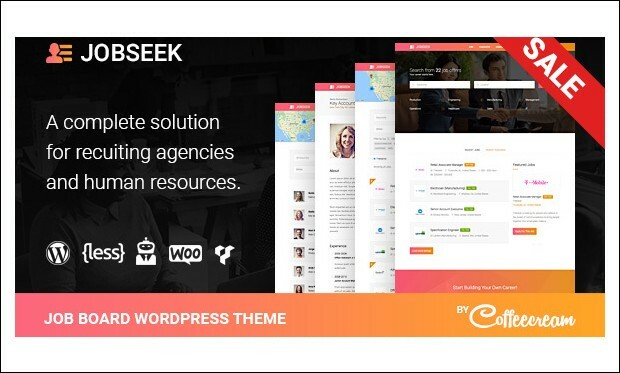 Jobseek is the robust job board wordpress theme for recruiting agencies and human resources. It has all the features and plugins which help in creating the powerful job portals and websites that help in easy search and posting of jobs. Job Career is a fully featured and complete responsive WP theme for job boards that helps in easy and fast creation of job listings website. This theme is feature packed to create the fully responsive job portal and career website. 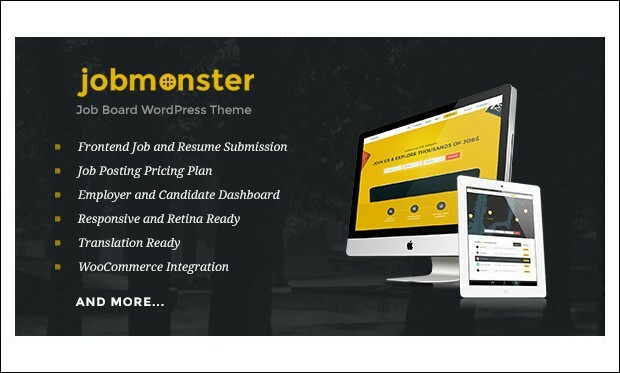 Jobmonster is the powerful and creative job board wordpress theme that helps in creating the fully responsive job portal that looks great on any type of device like PC, smart phone or tablets. Its clean and valid code helps in easy creation of the powerful job portal or website. 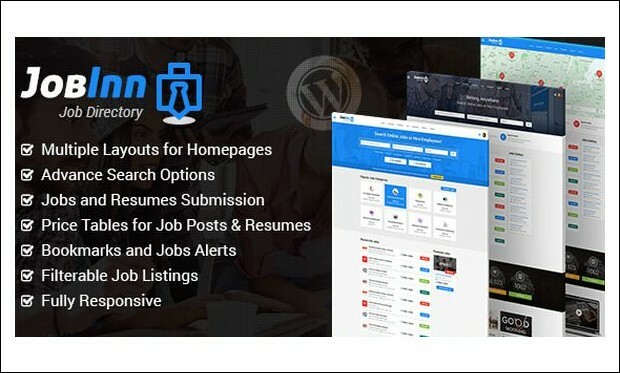 JobsDirectory is the perfect and clean job board wordpress themes that help in creating a powerful job portal in an easy way. It has many pre-made and built-in features, so the developers can easily create the best job portal within minutes. 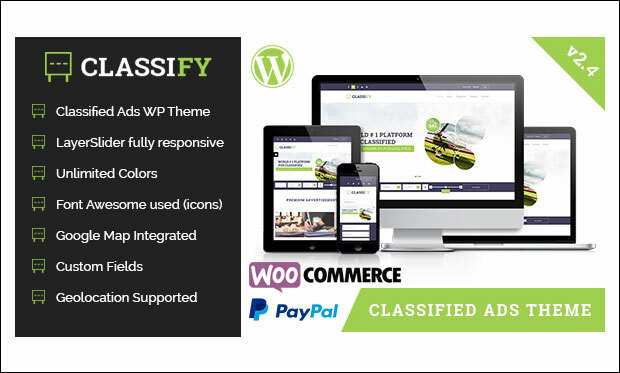 Classify is a modern WordPress theme especially designed for creating classified ads website. This detailed classified ads theme comes jam packed with lots of features to help you with easy configuration and customization of the website. 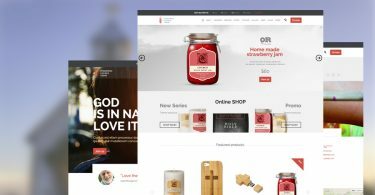 It is built with HTML5 and CSS3 technologies and based on bootstrap and redux framework. You can easily accept payments as this theme is integrated with PayPal payment gateway. 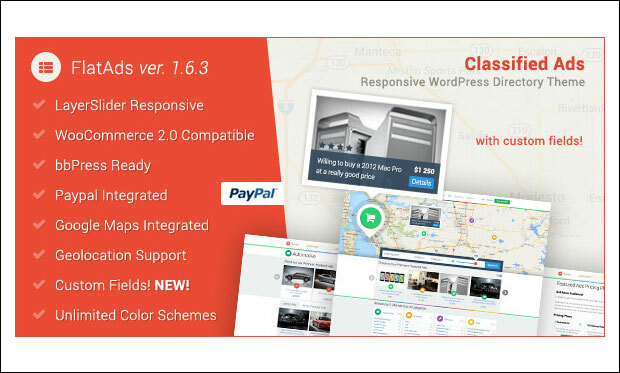 FlatAds is responsive and feature rich WordPress theme mainly designed for those who wish to create their own website to showcase classified ads, directory and listing in a professional way. 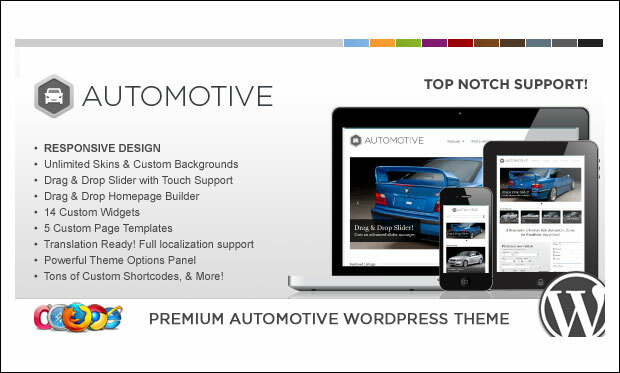 Customize every element using unbranded advanced theme options panel. The theme is integrated with PayPal, Google maps and supports geolocation. It is search engine optimized and translation ready. 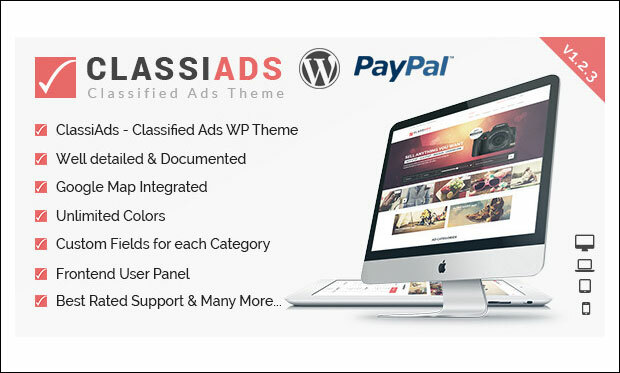 It’s a clean and bright classified ads WordPress theme that comes loaded with tons of features. You can integrate social media icons to let visitors share important content among their friends circle. 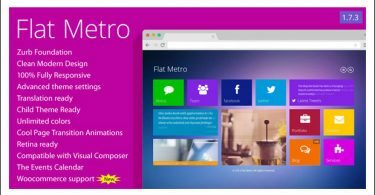 Classiads theme is based on redux framework and coded with HTML5 and CSS3 techniques. It is integrated with PayPal for accepting payments with ease. Create multiple slides with stunning animations via layer slider. 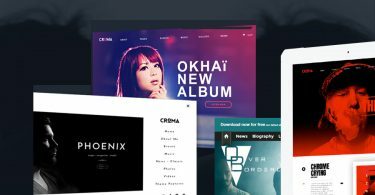 It’s a beautiful WordPress theme that is built with the latest HTML5 and CSS3 techniques. This theme is based on rock solid framework and comes integrated with PayPal payment gateway and frontend submission system. Get your site running out the box by making use of the extensive documentation and video tutorials. You can create unlimited layout possibilities with the help of powerful page builder. This WordPress theme can be used for creating websites related to classifieds, listings or directories. It allows you to choose from unlimited skins and patterns and 40+ custom Google fonts to match your style. Child theme creator is a unique feature of this theme for creating child theme within few seconds. The theme is SEO optimized for enabling search engines to quickly crawl and index your site. 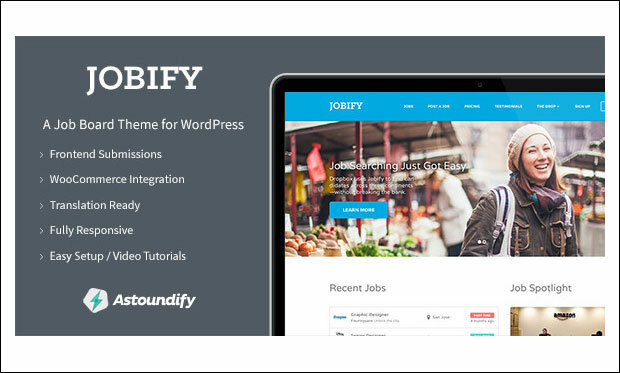 Jobify is one of the best job board WordPress theme that can be easily setup without any coding skills. 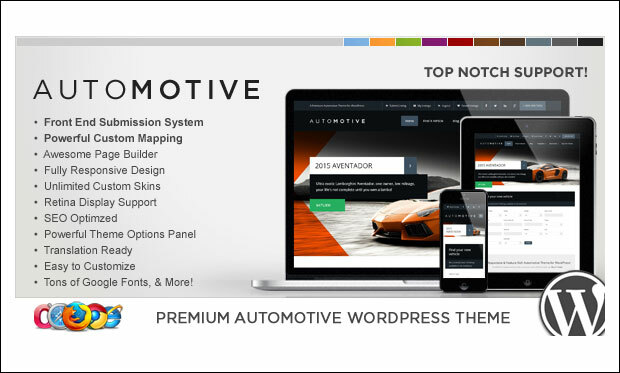 This themes comes integrated with popular plugins like slider revolution, WP job manager, resume manager, WooCommerce paid listings, Soliloquy lite, testimonials, gravity forms and ninja forms. It includes extensive theme documentation, page templates, stunning typography, custom shortcodes and XML demo content. 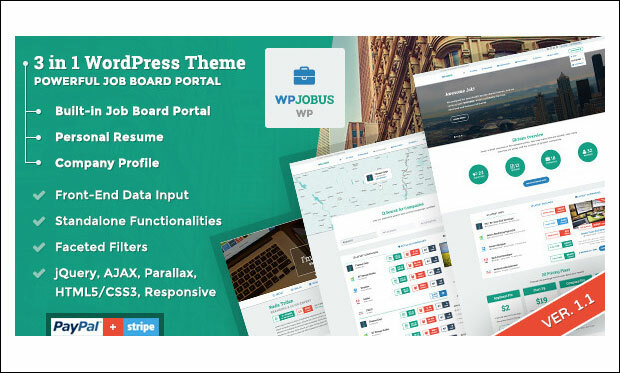 WPJobus is a modern WordPress theme that can be used for job board, personal resume and company profile. This theme allows administrators to review and publish resume, company profile or jobs from the frontend with ease. It is optimized for tablets and mobile devices due to its flat responsive layout. WPJobus theme can be translated to multiple languages as it supports multilingual plugin. 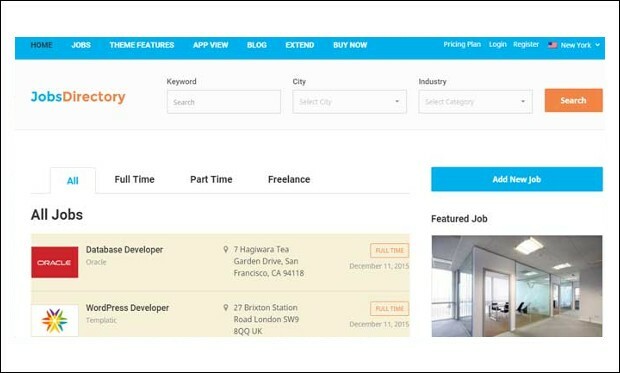 PetSitter is the latest job board WordPress theme that is built on bootstrap 3.2 framework. You can showcase the list of job vacancies related to pets in a beautiful way. 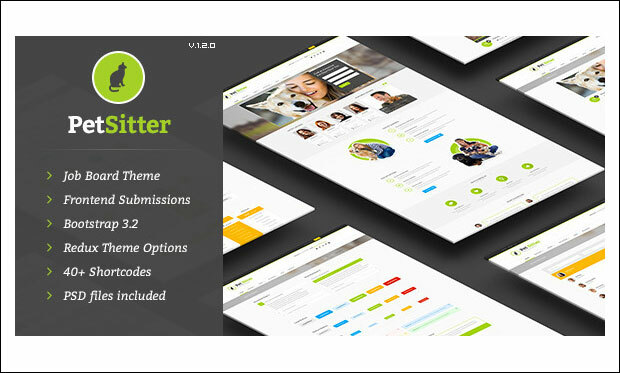 This theme comes integrated with WP job manager and resume manager plugins. Customize the theme via theme customizer and have preview of the changes made in real time. It features working contact form and Google maps integration. 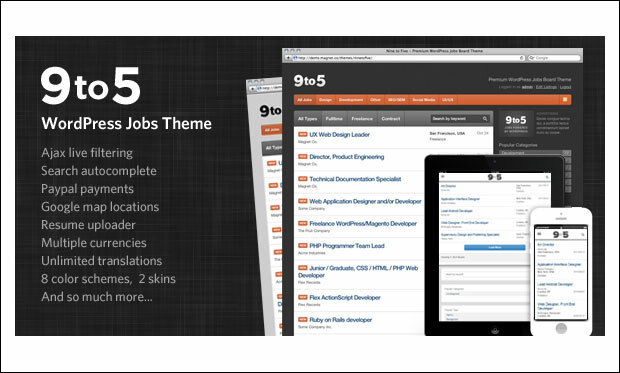 If you are in search of a best WordPress theme for your job board website then 9to5 theme would be the one for you. Due to its responsive design, this theme looks and works great on any device. You can even turn off the responsive mode of this theme. It features Ajax live filtering for scanning the job lists without any need to reload the web pages. 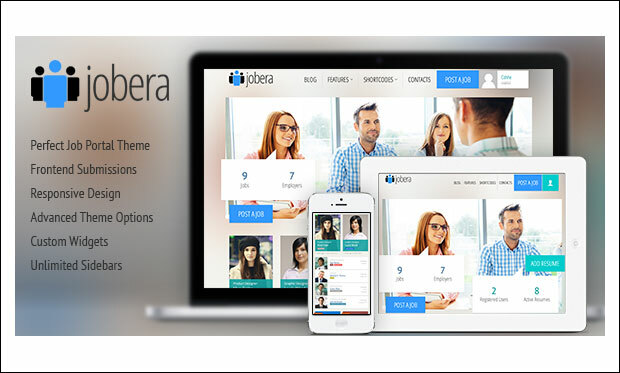 Jobera is a bold job portal WordPress theme that could be installed at an affordable price. Give your site a unique look by using multiple colour schemes, unlimited home page variations, shortcodes and 100+ Google API fonts. You can import the demo content in a single click and customize it via powerful admin panel. It lets you embed Vimeo, YouTube, Selfhosted and Dailymotion videos within your posts. It’s elegant and flat designed WordPress theme especially designed to help users create a powerful job site for nannies or baby sitters. 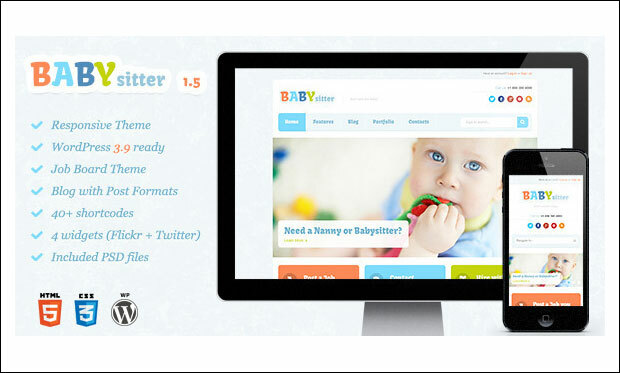 Babysitter theme is built on skeleton framework and compatible with the latest version of WordPress. By using theme options panel, you can customize and control every element of the theme with ease. You can display job locations by integrating Google maps into the site.